Manufacturer of a wide range of products which include tea leaf vacuum packing machine, double chamber vacuum packaging machine, vertical vacuum packing machine, vacuum packaging machine, spvp-300 vacuum packaging machine and table top vacuum packing machine. Backed up by our years of experience, we are offering high-quality Tea Leaf Vacuum Packing Machine to our clients. Backed by the technological expertise of professionals and our vast domain experience, we are offering Double Chamber Vacuum Packaging Machine to our clients. The products after packing by Double Chamber Vacuum packing machines can be prevented from oxidation, going mold, insects or getting damp, thus can be kept fresh for longer time. 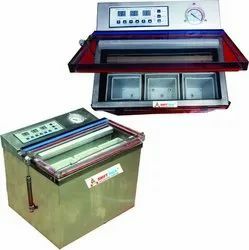 Double Chamber Vacuum packing machines are useful for packing of meat products, sea food, medicine, electronic components, hardware’s, and medical instruments etc. 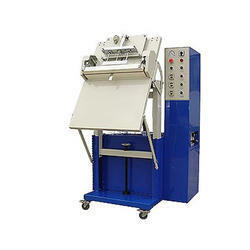 Backed up by our years of experience, we are offering high-quality Vertical Vacuum Packing Machine to our clients. Vertical Type Vacuum Packing Machine not only can do the process of sealing but also vacuum extraction or inert gas flushing after vacuum cycle. Vertical Type Vacuum Packing Machine has chamber less design with double gas nozzles, so its application is not limited by the size of a vacuum chamber. Vertical Type Vacuum Packing Machine is suitable for a package which has low demand on vacuum degree but high demand on the purity of inert gas. 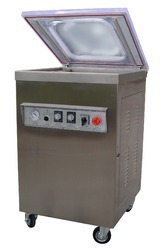 Vertical Type Vacuum Packing Machine is not limited by the size of a vacuum chamber. Backed up by our years of experience, we are offering high-quality Vacuum Packaging Machine to our clients. Backed up by our years of experience, we are offering high-quality SPVP-300 Vacuum Packaging Machine to our clients. 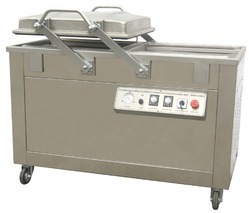 Backed up by our years of experience, we are offering high-quality Table Top Vacuum Packing Machine to our clients. 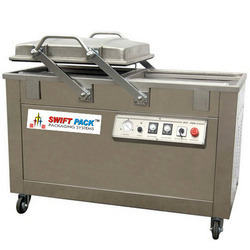 Backed up by our years of experience, we are offering high-quality Vacuum Packing Machine to our clients. Backed up by our years of experience, we are offering high-quality Single Chamber Vacuum Packing Machine to our clients.